Ok a disclaimer first. The original recipe for sous vide sio bak (Chinese roast pork) came from the Food Canon’s blog. This already awesome recipe is actually good to go, but I figured that I needed a truly fool proof tweak for a perfectly crispy crackling. The quest for the ultimate roast pork belly is a study of contrasts – soft and melt-in-the-mouth meat and crunchy and puffy skin. Because hubs is not a pork fan, it is really only at Chinese New Year that I make this dish. So the improved versions have been at a glacial pace of transformation (literally year on year) but now I think I’m happy with the results. And the fact that my non-pork eating husband actually ate and praised this dish was testimony indeed. Why sous vide what has traditionally been purely a roast? Most Chinese BBQ meat stalls would never even know what a sous vide circulator is. But there is a reason to up end tradition and the sous vide pork belly is actually more tender and juicy than the traditional version. In fact, this is the one reason why I keep a sous vide circulator. Yes, sous vide steak and sous vide Japanese Cha Shu are awesome, but this tender pork belly is the quintessential reason why the sous vide circulator still has a place in my kitchen. Sous vide cooks meat low and slow and gently breaks down the connective tissue in the meat. There is no better way to achieve the tender mouth feel of this dish. 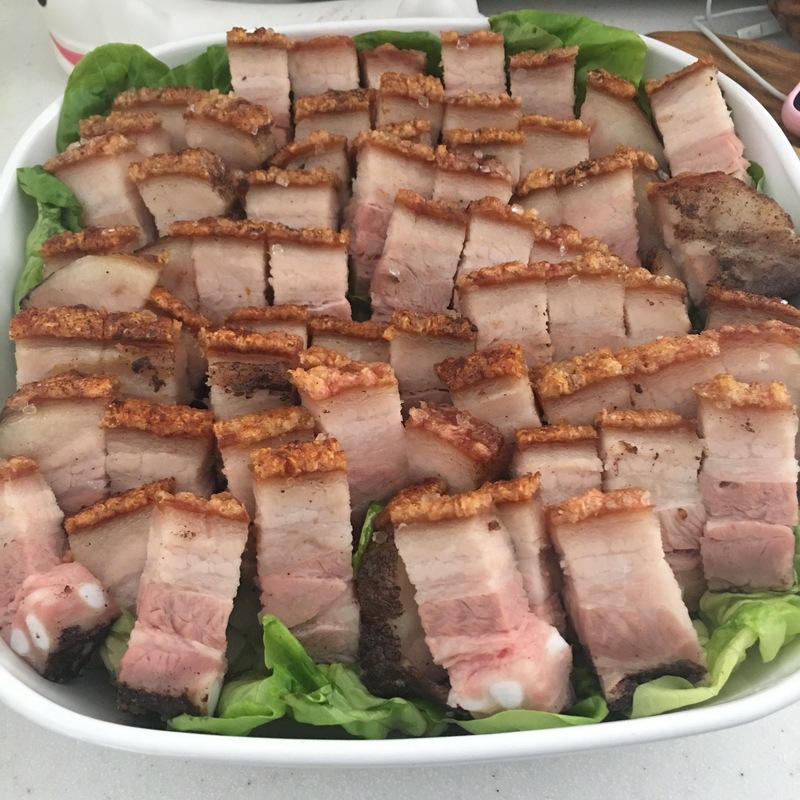 The other important key is to get really good pork belly – this is the reason why I brave the crowds at Ghim Moh Market before Chinese New Year. The pork belly there must come from young pigs because the fat layer is thin and the meat tender and juicy. Pork belly in the market runs out really fast and any housewife worth her salt knows that you would have to line up from 6 am in the morning as the large slabs of pork belly are gone by 7 am. I was responsible for chagrin and silent gnashing of teeth of the ladies behind me in the queue when I bought the last large slab of pork belly for the day I was there. There was, I confess, a great sense of satisfaction, similar, I suspect, to what a prehistoric huntress would have felt. To be honest, this dish does take some work but it is well worth it. This dish calls for serious love 😍. Prepare the pork belly. Cut the pork into 2 large pieces. Insert 2 satay sticks into the body of the meat in a criss-cross fashion to keep the meat straight and uncontracted during the sous vide process. Coat the bottom of the pork (meat portion) with the fine salt, white pepper and five spice powder. Vacuum seal. Set the sous vide machine or circulator at 62 deg C. Sous vide the pork for 6-8 hours. Cut open the packets and remove the satay sticks. Use cling wrap to wrap the sides and bottom of the pork belly, but leave the skin side exposed. Dry in the upper shelf of the fridge for at least a day. Remove the meat from the fridge. Remove the cling wrap and wrap the sides and base of the pork belly pieces with aluminum foil instead. With a satay stick, poke tiny holes in the skin, careful not to poke too deep into the fat layer under the skin. Carefully slice only the skin of the pork belly in 1 cm width cuts. This will make it easier to cut later after roasting. Top the skin with the coarse rock or sea salt. Turn on the oven grill and set the temperature at 200 deg C. Place the foil based pork belly pieces on a baking tray and grill/bake for 25 minutes. Remove from the oven. Scrape off the coarse salt. If there are still spots where the skin has not puffed up and crisped up, you can consider returning the pork belly to the grill for another 5 minutes. Remove from the oven. Remove the aluminum foil. Slice the pork belly along the previous score marks. Cut each slice into 1-1.5 cm width pieces. Serve hot with some good chili sauce on the side. Oh…there are 4 stalls in a row – the 2 uncles in the middle have the nicest pork; but one is grumpy and one is nice. I go to the nice guy (talk, chatty with glasses)! Welcome! Let me know if you are successful! It's Singapore. The natives are restless. They seem to think of food from the time they wake up in the morning till the wee hours of the morning. To survive this food jungle, low carbers must go on a quest to discover how to avoid traps like rice, noodles and wheat. Join me on this journey of rediscovering Asian food the low-carb way. You may yet survive this quest.